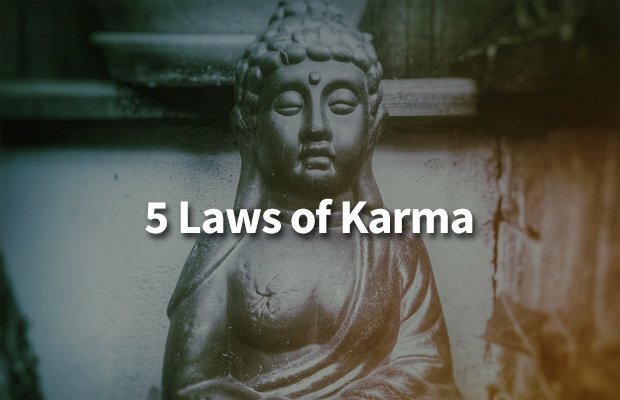 The Laws of Karma can viewed as the Buddhist and Hindu version of the Golden Rule, which is basically that you should do unto others as you would have them do unto you. This Golden Rule is stated by practically every religion in the world, as it teaches us that we are responsible for our actions. Buddhism goes a bit further, incorporating intention and thought, as well as spoken word and action. Everything we feel, say, do, and every choice we make ripples through time, and these choices are our karma, whether they be good or bad. In the same way that gravity acts as neutral and constant force, the Laws of Karma apply to all beings equally, without exception. It exists without favorite ones, without cursed ones; there are only the divine beings manifested by the Creator, and all of these beings are loved and cared for equally, deeply, and completely. When we reincarnate we do so to learn what is and is not like love. When moving through worlds of duality, we learn from experiencing the extreme opposites: good-bad, problem-solution, etc. until we are able to evolve into divine love, joy and awareness. One walks the divine circle until their lessons are learned. The objective in learning lessons is to achieve a sense of balance. Imbalances are what drive your personal cycle of reincarnation. For example, whatever you bring hate to, is what you reincarnate to, so that you might have the opportunity to achieve balance. Because you can only truly understand a thing when you become that thing; ceasing judgement and the harboring of unrealistic expectations. Because everything in the universe is energy, the universe is constantly expanding from lower to higher vibrational levels. And due to this constant expansion, change and growth are all but certain. The universe grows by weaving its way through chaos, reorganization, and order in one long endless cycle of change and growth, executed in hopes of continuous improvement. Karma comes full circle with love. The entire purpose of Karma is to propel your soul on a personal journey of reincarnation through the universe, eventually bringing all of us into a state of divine love, joy and awareness. Karma ceases when you have perfected your ability to love unconditionally. This post was republished from heartcenteredrebalancing.com. You can find the original post here.